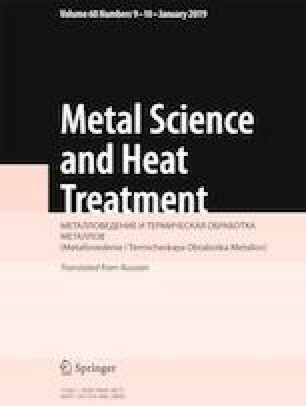 The structure of surface layers of titanium alloy OT4 subjected to non-vacuum electron-beam treatment with power density of the beam equal to 0.28 – 0.90 kW/cm2 is analyzed. The microstructure of different zones of the material after the treatment and the crystallographic texture appearing in the surface layers as a result of the electron-beam impact are studied. The microhardness of the remelted layers and of the heat-affected zone is measured. Mathematical modeling is used to obtain the distribution of the temperatures and the heating and cooling rates over cross section of the treated material. Translated from Metallovedenie i Termicheskaya Obrabotka Metallov, No. 10, pp. 10 – 17, October, 2018.